This past weekend I went to visit my friend Bea in New York City. I found a round trip bus ticket for cheap and was off for the weekend. Let me start by saying that I do not do well on public transportation. I get really motion sick and sweat...it's awkward for me and whoever has the honor of sitting next to me. So leaving on a Friday from DC at 5:30 in rush hour traffic probably wasn't the best life choice I have ever made. I got a ticket for the Bolt Bus, which promises free wi-fi and plugs for you to charge your junk. That sounded a little icky. By plugs I mean outlets and by junk I mean technology. I had this idea that I would be riding to NYC in style. Watching Instant Netflix on my charged computer. Sipping tea. Twirling my handle bar mustache. However, when I went to plug my charger it didn't fit. Despite all my efforts, and the fact that I looked like a chimp trying to solve a math problem, it wasn't going to happen. Resigned to the fact that it was just me and the iPod for the trip I settled in for the ride. As we were in the thick of the traffic, and I was at the peak of my motion sickness I felt this hard thump on the top of my head. I suddenly transformed into Chicken Little. The sky was freaking falling. HARDCOVER BOOK fell out of her tote bag and onto my noggin. "THIS IS THE START OF YOUR ROMANTIC COMEDY!" "Yeah well I also now know what it smells like if Taco Bell and Subway had a food baby, due to the two skanks sitting next to me eating tacos and a $5 footlong." 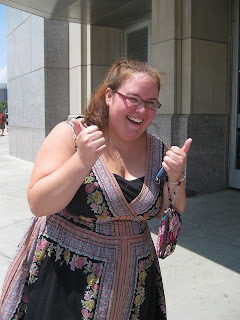 Once the bus got rolling I calmed down and no longer felt ragey or barfy and was ready for NYC. Saturday was when the magic happened. I can only describe it as one of the coolest days of my life. I have many secret shames, which I'm sure will be revealed at some point. 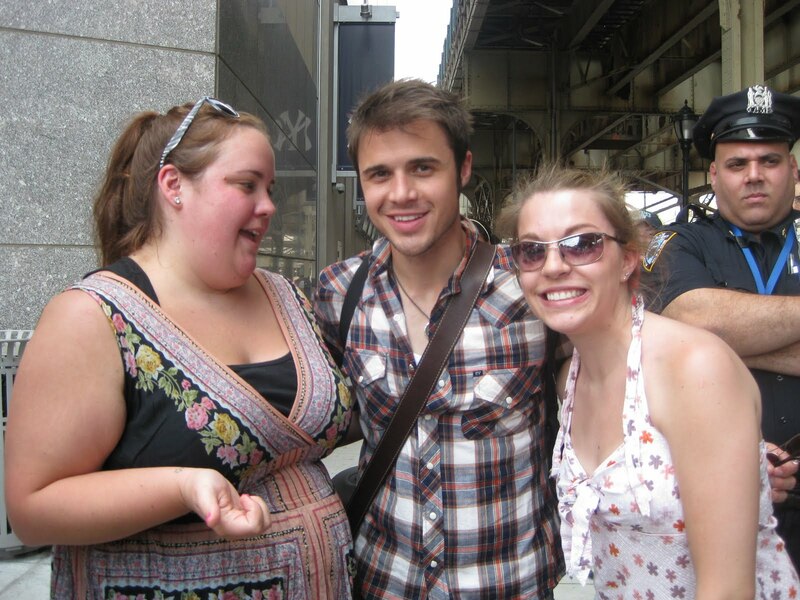 A giant secret shame is my love for Kris Allen. 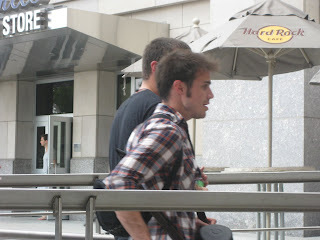 Bea and I have had a secret quest to meet him for about a year. We went to the American Idol's Live tour last year and failed miserably in meeting any of them. When I was planning my trip to visit, Bea informed me that Kris (we're on a first name basis) would be performing at Yankee's stadium for $5. As we were walking to the stadium so sweet lady handed us free tickets. Hello Heaven, it's me Ashley. Thanks for making that happen. my little love bird performed a ballin' show. 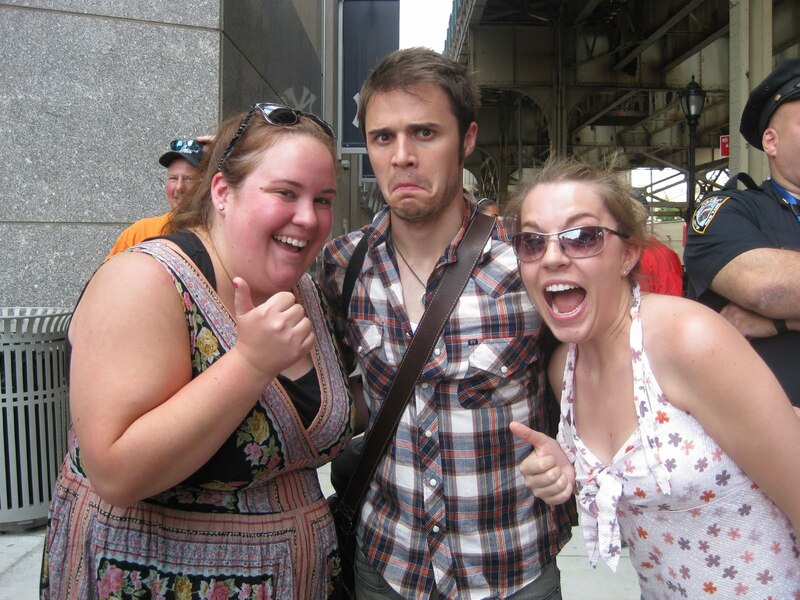 I just said ballin' in reference to Kris Allen. After the show we wandered for a bit and decided to head back to the subway and hang out in Union Square park. Then Bea spotted Kris Allen's tour gear. Oh...I think you know where this is going friends. We hunkered down made friends with the road crew and discovered that Kris hadn't left yet and would be exiting shortly. Then when we finally elbowed the 10 year olds out of the way it was our turn to take a picture with him. Here's me telling him that I tweeted to him earlier in the day. Jones: "I tweeted you earlier." Kris: "Really? Well...what'd you say?" Jones: "That we were hanging out." Jones: "Can we take a funny picture together?" I'm gonna let all this sink in and come back in seconds with more epicness. Well worth the smell of the "food baby" I'd say! Very cool! i love the silly face photo! your such a good stalker when it comes to your musical loves!